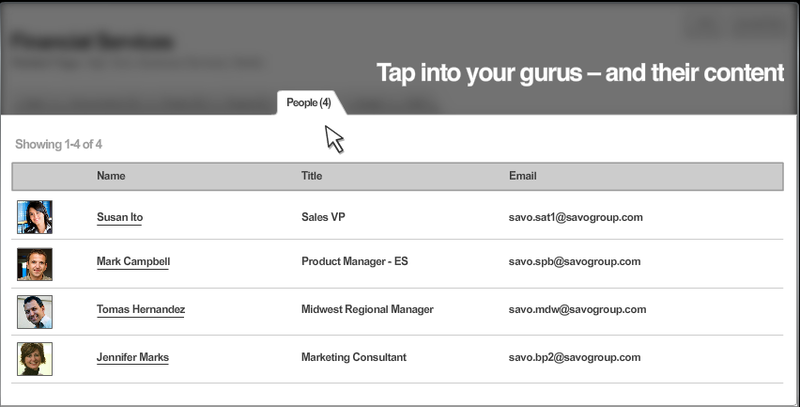 Mark Dascoli recently introduced me to SAVO, a system that aims to super-charge your salesforce by putting them in touch with the smart people and helpful documents you've already got hidden in your business. After my time at Apple, I'm obsessed with the potential for getting more done just by connecting the right individuals, so it's cheering to see a company based on that premise doing so well. Their software is aimed at front-line sales reps, and works a bit like a traditional sales portal, offering example presentations, marketing material and tips. Most wikis and other user-curated systems like this rapidly degenerate into a tangled mess, requiring 'archaeological skills' to dig down and uncover anything useful. SAVO try to avoid this by letting users rank and comment on content, and with a tagging system to keep things organized. What really seems intriguing is their insight that what makes a great sales rep is a deep network within the company, letting them reach out to the right experts at each point in the sales process. For example, being able to answer a customer's technical question might be the key to closing a deal, but that could mean knowing who to contact about an obscure aspect of product knowledge. They give reps a directory of expertise they can search, with is a huge step forward from relying on years of water-cooler osmosis to figure out who's who. They also have some smart interface ideas, like being able to cc the system on any email exchange to add it as content. This seems exactly the right way to go. A lot of my email exchanges were about technical points that would be useful as searchable resources within the company, but weren't worth the effort to tidy up and create as a web page. My work with Mailana is based on taking that approach a step further, by automating the creation of an expertise directory by analyzing the company's email, and using the same process to make external contacts outside the company a sharable resource. We're all aware of the potential of web technologies within companies, but there haven't been a lot of solid success stories. I'm very pleased to see SAVO out there validating us by making money!